Almost six hundred people have commented on Mr. Nordin’s post, puzzled at his outraged at a seemingly innocent activity. 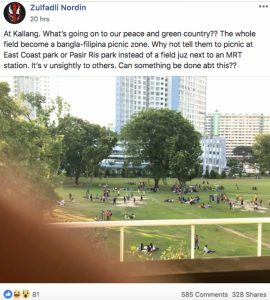 While some people seemed to agree with him, many more netizens jumped to defend the picnickers, saying that they had a right to enjoy their day off, and deserved a time of recreation as much as anyone else. 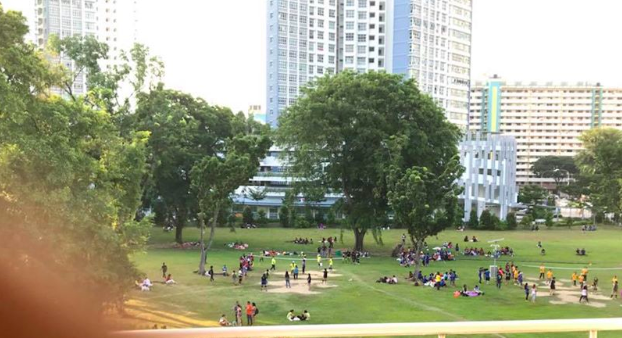 Mr. Nordin answered that the location was not right for the picnickers to stay there, and he said that they should spend time at the mall, or watching movies, like other citizens. Commenters reminded him, none to gently, that these activities cost money and that much of the income of these women probably goes to the support of their families back home. Some netizens chose to comment on the growing number of foreign workers in the country. Mr. Nordin diligently replied to many of the people who questioned his stand, which is how the comments on the post grew. 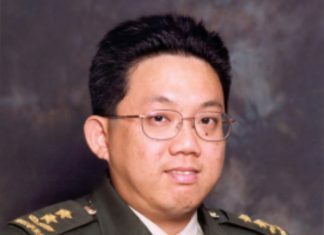 However, by 5:00pm on Monday, August 13, the post had been taken down from the COMPLAINT SINGAPORE page.